On the day of its 23rd anniversary, UNPO has attended the commemoration of the 30th anniversary of a major refugee flight from West Papua organized by the National Government of West Papua in The Hague. 30 years ago, on 11 February 1984, Apilena Sapioper was five years old when she and her family fled their village in West Papua as political refugees. The day before, the indigenous people of West Papua revolted in Jayapura. The uprising was triggered by the shooting of a member of a local community after he raised the morning star flag -the flag of West Papua- in the proximity of a government building. To crush the revolt, the Indonesian army launched a violent military campaign, which resulted in the flight of around 10000 Indigenous West Papuans. 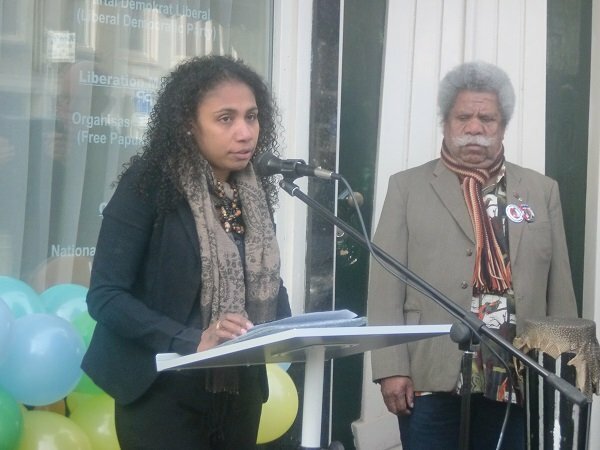 30 years later, on 11 February 2014, Apilena gave a speech to open the commemoration of this major refugee flight from West Papua organized by the National Government of the Republic of West Papua and the Nationaal Papoea Vereniging ’95 West Nieuw Guinea, in The Hague, The Netherlands. “You had only one choice: leaving or staying. And staying meant to die”, she explains after the ceremony is opened with a welcoming song. Apilena’s speech is followed by the singing of the national anthem of the Republic of West Papua, under the Morning Star Flag which is banned in West Papua by the Indonesian government. The word is then given to Jeroen Zandberg, speaking on behalf of the Unrepresented Nations and Peoples Organizations (UNPO), which also celebrates the 23rd anniversary of its foundation on the 11th of February. In a moment of commemoration of a tragic historical event for West Papuans, there is also space for enthusiasm over the new collaboration between UNPO and the National Government of the Republic of West Papua, which has become a member of UNPO in November 2013. Among the activities organized by UNPO to support West Papuans in the struggle for their rights, on 14 March 2014 UNPO will hold a side event on human rights violations in Indonesia at the 25th session of the UN Human Rights Council in Geneva. The stream of West Papuan refugees fleeing their land of origin to save their lives has continued until today. Most West Papuan refugees escape to the neighboring independent State of Papua New Guinea (PNG) where they live in a condition of statelessness. The majority of refugees tend to settle in instable border areas, where they live on subsistence farming under the danger of being taken back to West Papua. Others are settled in urban areas, where they work illegally and constantly risk eviction. Whether living on the border, in the city, or in designated refugees camps, West Papuan refugees settled in PNG cannot live a dignified life: they lack access to public services, sanitation, and often clean drinking water; they live in a situation of insecurity and constant uncertainty. Those who settled in other countries, such as the Netherlands, enjoy better life conditions, but still recognize themselves as refugees who cannot return to their motherland. Apilena and the members of the National Government of West Papua identify with those West Papuan refugees who have to endure difficult life conditions, and are making an effort to bring recognition and dignity to the life of their fellow West Papuans around the world and in West Papua itself. UNPO will continue to support them in this effort, by advocating for an improvement of the life of the indigenous people of West Papua.